The electric motorcycle Brutus 2.0 doesn’t lightly use the word Brutus for marketing purposes. 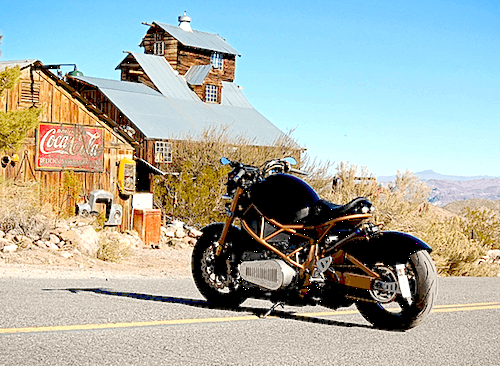 It is a brute when it comes to raw electric motorcycle performance. If Brammos and Zero Motorcycles are just not radical enough for you, you could always head on out to Chris Bell’s website, or Las Vegas if you are in the area to reserve your hand built in America, most likely only one on your block unique EV. Technically Speaking. This is no garden variety electric motorcycle, it is a monster, virtually. Slightly reminiscent of Ducatti’s Monster in looks, this beast achieves a 0 to 60 in 4.74 seconds. Using a 153v lithium polymer battery pack rated at 4.9kWh, it will take you 3 hours to charge it using a regular 110v outlet. The battery pack is designed to last up to 50,000 miles, something that will rejoice those slightly squeamish to adopt EVs. The electric motor is a D&D Systems brushed DC electric motor that can be tweaked to receive 88 or 96 volts via a programmable Manzanita Zilla 1K motor controller, depending on the amount of adrenaline you need to feel rushing through your body. Interestingly enough, this electric motorcycle sports a 5 gear speed box, which explains the range of at least 100 miles, something that will satisfy most anyone’s needs. You would probably not give it to a first time motorcycle rider, since this it weighs in at an impressive 535 lbs, something an experience motorcyclist would handle well. And to bring these pounds to a stop, the front brakes sports twin 6 piston dual rotor and the rear dual piston dual caliper single rotor are independently controlled. All in all, everything collaborates to move it over 100 mph. What’s The Price? So far, the estimated price is under $35,000, but the final price would be determined by buyer interest. In other words, the more orders, you guessed it, the lower the price would go. And just in case you’re still sitting on the fence, Bell is working on three other prototypes. The news bikes will have even better acceleration and geared toward police highway cruisers. Now excuse me while I wipe the drool from my foaming mouth as I imagine riding the Brutus 2.0 on desert highways onto a sunset. "Ultimate"? The bike made by Lightning Motorcycles would beat it any day. D&D's motors aren't exactly powerful and at 4.9kwh the battery pack is miniscule. The way these people should prove "ultimate" is to take it to the TTXGP race series or to a land speed record test or some similar event. There are people racing in both those venues who, I think, would beat that bike easily. don't be a lil fag.. haters gonna hate ,get a life you lil fag and stop hateing. this bike is hella sick with it , it sure as hell is the Ultimate of all the Ultimate with honors.....they put a lot of work on it , show some respectt....... you fag!